When Brayden (a Las Vegas native) asked me to marry him, a destination wedding in his hometown was our plan. I love all things related to paper, invitations, and stationery. So I knew I wanted something fun and exciting to invite our loved ones to our wedding! No one in my family (myself included) had ever been to Las Vegas, so I wanted an invitation that contained all the glitter and excitement that was in store. Wanting to include poker chips, the Paper Source box mailer was the clear winner. Our poker chips, dice and playing cards were all chocolate candy… creating another layer of experience for the recipient. I was really inspired by the bright colors of the casinos. Each part of the invitation has its own vivid color – the box mailer is red, the invitation card is curry, the response card is spruce, and the return envelope is fuchsia! To tie them all together, I printed everything in black and red ink (my interpretation of a deck of cards!) and layered it all on top of shredded gold foil paper. As a Vegas native, I HAD to comment…These are FAB! I love that you went for it! agreed. these really ARE fab. 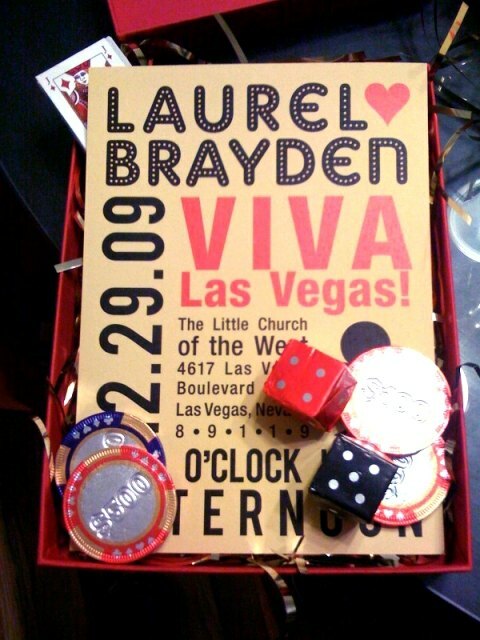 I am getting married in Vegas too and I will love to do something similar. What was the postage? and What are the fonts used invitations? Postage was close to $3.00 each (maybe because of the chocolate’s added weight). The other fonts are all manipulations of Helvetica. Hi Laurel – I adore your invite layout and fonts! Can you tell me how you mailed these out? How did you secure the box closed? Did you put them in a bubble mailer? Did you wrap them in kraft shipping paper and put a label on the outside? I’m dying to know those details!! WOW these are awesome! I am loving it! Where can I find the boxes you sent them in?? Chrissie, see our other post about a wedding where these invitation boxes were used – Heather shares a few ideas of how to mail them. 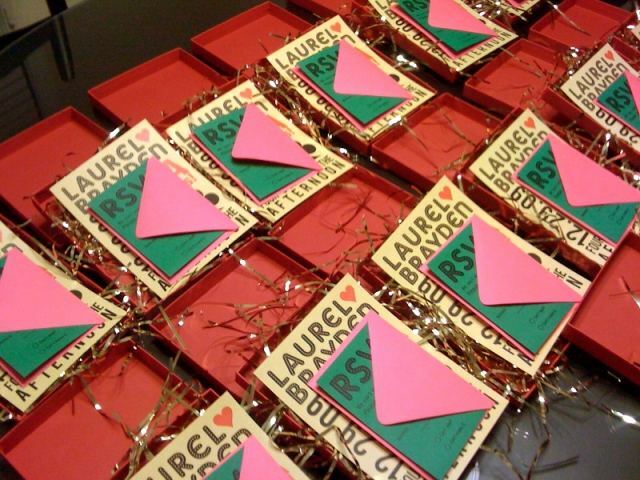 Kendell, Laurel used our handy box mailers for her invitations. They’re available in many PS colors. Love it! I so want to use your idea for my wedding invitation but have no idea how to get started. Can you help me or give me suggestions? Just curious – does your invite have the word “wedding” or “marriage” on it? Also is that a clover beside the address of the little church of the west? Btw I love your invitations they have inspired me to do something similar! This is a fabulous invitation. Where did you get the chocolate dice and chips?